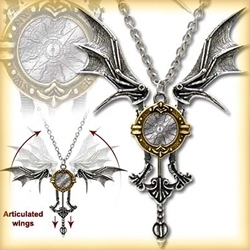 The Icarus Ex Machina Pendant is based on the Icarus Project, the dream of mechanical flight. "From the blueprints of the Black Baron’s own prototype pinion-frame, this amazing, technological masterpiece is spring-driven and is animated when the pendulus is pulled." Two-tone English pewter brass compass dial contraption that actually moves when pulled, and can be worn in either position. Made of fine crafted English Pewter.